One of a kind ways to preserve your freshly dried herbs. Start your collection and create the world's COOLEST spice rack! What you are looking at is a 2 pc. Rasta Fade set by Lotte'. 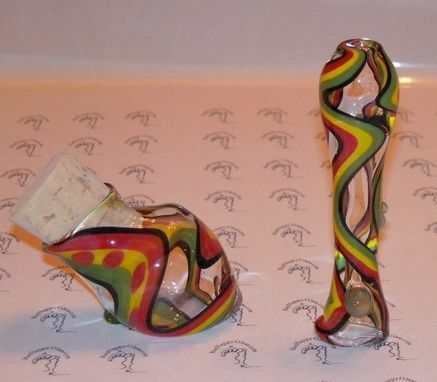 Truly one of a kind - UN-duplicatable glass art! Borosilicate Glass Herb Jar and Heavy Hitter chillum pipe. 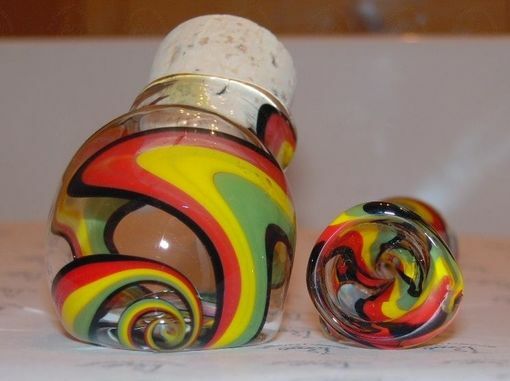 The Jar is approx 2 1/2" top of cork to spiral end - Pipe is Heavy walled and measures over 3"
Fully enjoy your original handmade work - BE A KNOWLEDGEABLE buyer and Buy Happy! 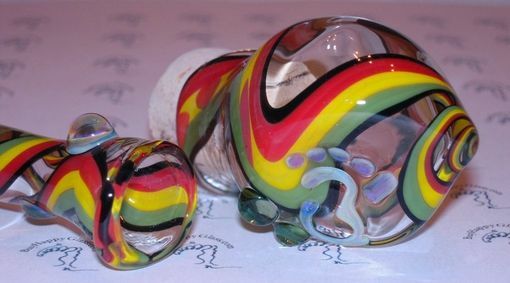 **note: All torch worked glass from Happy Hollow Glass Studio starts with the highest quality borosilicate tubing and rods. All Happy Hollow Glass is properly annealed in a digitally programmable kiln for maximum control. Annealing glass is critical to its durability. IF GLASS IS NOT ANNEALED, it will retain thermal stress and decrease overall strength and durability where even the slightest tap could cause a crack or break. 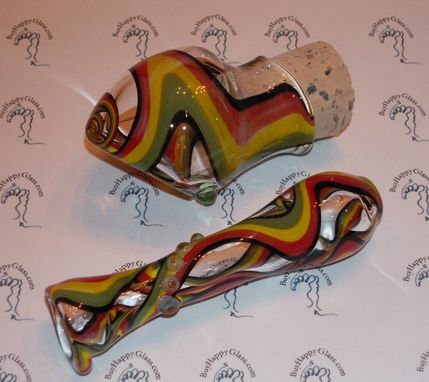 By purchasing from Charlotte McGrath or any site associated with Happy Hollow Glass Studios (a.k.a HHG) - you release HHG from any and all liability due to broken glass injuries - All Happy Glass is GLASS and it is the nature of glass to break occasionally. Care should always be used when handling glass. Should your item break for any reason PLEASE contact me to discuss repair or replacement. All glass straws have a lifetime warranty. Must include original items and invoice copy (paper or digital) with return. By purchasing any item from HHG you acknowledge that you are 18 years of age or older.